Eryngium x zabelii ‘Big Blue’ is a member of the Apiaceae family and can be found in the Herbaceous Border. 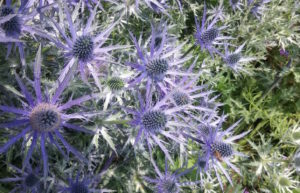 This sea holly has very intense bright blue flower heads about the size and shape of a small egg, produced in groups at the top of the flowering stem; it will flower throughout July and August. The flower head is surrounded by a ruff of silvery blue stiff and spiky bracts. It grows to about 75cm high with spiky, divided, silvery green foliage that discourages grazing by animals. Eryngiums prefer full sun; in fact their colouration is more intense in stronger sun. They will grow in any type of poor soil that is well drained. Sea hollies are deciduous, but the seed heads should be left uncut over winter as they add form and substance to the garden. These plants can be propagated by root cuttings, in late winter, but as they dislike root disturbance, the tap root should be exposed and fibrous roots taken with a sharp knife. The pencil thick roots about 5 to 10 cm long should be cut horizontally to mark the top and with a slanting cut to mark the bottom. Insert the cuttings into compost that is 50% peat and 50% grit to give good drainage. Set the cutting so that the horizontal cut is just below the surface of the compost, water sparingly put outside and allow nature to take its course. By next spring the cuttings should show growth, and by the following spring they should be large enough to plant out. The flower heads are very useful dried in flower arrangements.